Around one-third the state is now under a burn ban as extreme dryness and heat continue to blanket Iowa. State Fire Marshal Ray Reynolds has issued a release calling the conditions a “dire” situation. “Our concerns clearly are the stability of our crops,” Reynolds says. 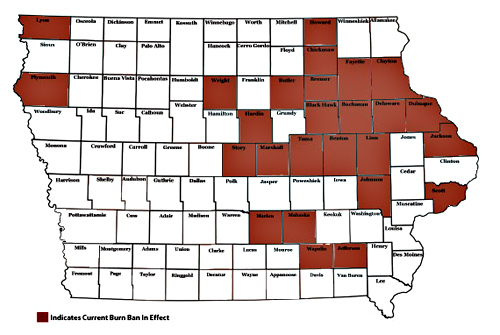 “The vegetation is turning brown and we’re seeing a high risk of fire spreading a considerable distance as a result of sometime careless and reckless actions.” A burn ban prohibits Iowans from open burning. Reynolds notes much of eastern Iowa is so dry that small fires could spread dangerously fast over several acres. “Our most likely cause of grass fires is just people who choose to burn brush piles that get out of hand,” Reynolds says. “They don’t think it’s any big deal, but pretty soon a little wind and a little spark and ash will carry a fire a considerable distance.” Although Independence Day was two weeks ago, Reynolds says some fire departments are still being called to douse grass fires caused by the illegal use of fireworks. “Another common risky behavior we see is people throwing cigarettes out the window of their cars which are responsible for starting a lot of ditch fires that can travel throughout fields,” Reynolds says. This is busy time of year for camping, but Reynolds says campfires should only be started in pits that are encased in proper materials. “By that, I mean bricks or an outdoor fireplace that is specifically design for fire. To have an open campfire is certainly not permitted,” Reynolds says. This level of extreme dryness in Iowa hasn’t been seen in more than two decades. Governor Branstad has scheduled a public meeting for today in southeast Iowa to discuss the drought conditions. The two-hour long forum is set to start at 9 a.m. at the Mount Pleasant High School gymnasium.